Machine made in Tokushima, Japan with Kozo mulberry fiber, Moenkopi Washi Kozo 110 Paper from Moab embraces the tradition of Japanese Washi while providing a smooth matte surface reminiscent of hot press papers. 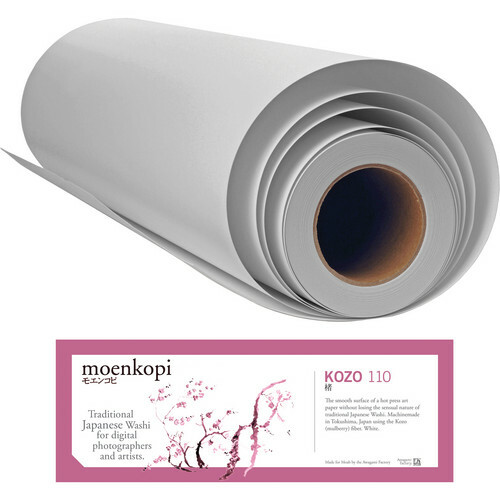 Available here as a 24" x 49' roll, this paper has a unique feel and a natural white color that makes it desirable for many artists and advanced printers. The 110 gsm paper also has a thickness of 18 mil and the surface is both water resistant and acid free for longevity. Box Dimensions (LxWxH) 25.0 x 5.5 x 4.0"